Other memorials, one for each brother, were erected at different locations. The younger brother, E A Lendy, is remembered in Sierra Leone. There was a monument to CF Lendy at Bulawayo in Zimbabwe, although this may have been destroyed given the current political situation in that country. In addition, this website concentrates on CFL's role in the founding of Rhodesia. He was instrumental in introducing the Maxim machine gun to warfare, and is sometimes referred to as "Maxim" Lendy. According to the Army Quarterly and Defence article, he collapsed and died of peritonitis on 15th January 1894. Elsewhere, another interpretation places him at the Tati Hotel (in Botswana) where his illness was attributed to a heavy bout of drinking and eating. CFL's demise was reported in the News of the World on 21st January 1894. Edward August Lendy was, perhaps, the more heroic brother. He was posted in Sierra Leone where received a Distinguished Service Order for services to the colony. In the Autumn of 1893 he bravely rescued several of his men from drowning during an ill advised river crossing. For this he was awarded the Silver Medal of the Royal Geographic Society. However, he never collected this as he was subsequently killed in a case of "friendly fire" by French forces with whom the British were allied. This tragic event occurred at Waiima on 23rd December 1893. These events were reported in the News of the World on 7th and 12th January 1894. The medal images were taken from the website of his school, Haileybury in Hertfordshire. Major Lendy ran the Sunbury Military Academy at which both of his sons received training. Only the East Wing, at the end of Loudwater Close, remains. The central section was destroyed by fire at the end of 1915. 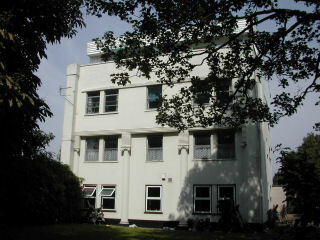 The West Wing survived, later as a two storey building, until the 1970s, when it was demolished to make room for a new housing development including "Academy Court". AFL also authored "Elements of Fortification", a text for "the use of students, civilian and military". This was published by John W Parker and Son of The Strand, London in 1857.